The National Coordinator of the All Progressive Grand Alliance (APGA) Media Warriors Forum (MEF), Chinedu Obigwe yesterday said that for the zoning arrangement in Anambra State to be sustained, Governor Willie Obiano should be supported to complete his second term bid in the forthcoming governorship election. Obigwe said that, “For political reasons, other political parties can promise to go for only one term to curry political favour but before being hoodwinked with their campaign promises, voters should consider the implication. Voters must say no to godfatherism and they must also say no to the looming marginalization of the people of Anambra South by voting for Obiano to complete his second term in office after which power can return to the people of Anambra South. ‘Electioneering campaign’ is sheer verbiage! From October 1st 2017, what will exist in the five south east states of Republic Of Biafra is Biafran Interim Government. 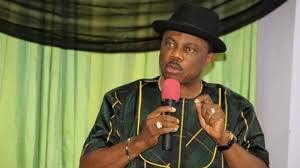 If Obiano do not want to serve as interim governor of Anambra state under God given Republic Of Biafra, he should prepare to vacate, APGA party has to prepare to provide replacement to serve as interim governor of Anambra state under God given Republic Of Biafra. God Is With Us!! !